It's a bit windy this afternoon, or perhaps I simply tell myself this so I can forgo a wooden match attempt and jump right to using my new Bic. It's grey, and why yes, I do hope to someday be a B&W flick. A foot ribbon! Whoopee. White. Fantastic gold embossed over white main band. I think of wedding bells. Not me wedding the stick, I'm not a Unitarian. But the whole stick ensemble speaks to me of wedding party. We all know what Connie Shade looks like. This one has some green notes coming up through and into a marbling. Minimal veins, even seams. Not a lot, if any, spider veins. Very nicely affixed cap. Nice even sheen over-top. Fair amount of slick for a Connecticut. Tobacco at the foot is mainly chestnut colored with a tick or two of dirty strawberry blonde highlights. Density is a -medium. Suede hand-feel. Minimal vein impediment. Even balance. Lively oils. Charmin test squeeze is a -medium resistance and evenly so. A bit spongy. Enough oils are on the shaft, that my fingers pick up a trace amount. Schnoz notes from the shaft are a sweet cream honey'd hay. Espresso beans, a small bit of them, are on the foot. They linger in the nose hairs. Some yeast is added to the hay there. Very honey-filled cold draw on a medium resistance swig. Hay notes pull back to tobacco to show a nice complexity. Very creamy mouth. Toasting the foot releases an aroma of roasting honey and a sort of nuttiness that seems laced into the tobacco note. Eager toasting and light. First hot pull showcases a zetz of interesting tobacco with nuts and hay and earth within it. Some leather is crisp on the palate and lingering. Mouth is creamy and warm. Honey is there. Second hot one is retro-haled to give some finely ground white pepper which cuts the cream nicely and too balances the honey. Tobacco is richer and more full but still smooth. Third hot draw is all hands on deck and a higher honey note, which brings with it the white pepper and also some leather with a wood chip characteristic. The notes here are clearly delineated, but also a bit closer to one another than many other offerings -- a narrower field, but I'll hit ya with a better analogy soon, gentlepersons. Ash is bright white with only the tip deviating to near charcoal. Burn-line is settling and shows a -medium thickness. Draw has picked up some tension and sits at a medium+, right in my preferred wheel-house. Nice tingle on the tongue. Nice sweet palate. Nice creamy mouth-feel. The toastiness comes in now and is a high backing note straight through to the finish. I mentioned a better analogy, and bear with me. Many to most offerings see their flavors rise from, or ride along, their backing notes. I feel these notes cascading as a waterfall, onto the toast backing. They fall altogether, and hence a more narrow scope. There is a definite locked-step movement in the flavors. A march -- or a aforementioned cascading waterfall. Gravity pulling uniformly down. There's a calm, too. Construction softens a tick ahead of the char. Smoke out-put is zaftik white sweetness with a complex tobacco note. It smells and looks classy, this Manolo Estate. Burn evens to straight. -Medium line. Nuttiness in tobacco is a peanut thing and somewhat of a coconut rises from wood chips. It smokes a bit on the quick side. A milkiness comes in now, which I discuss in bucolically profound ways in my most recent Sabbath Smoker. It stems in an interesting way from the toasting cream. Usually you get oils there, this -- milk. A heavy whipping cream. Toast firms up below. I almost think of my mom's toasted Wonder bread schmeared with cream cheese and sprinkled with cinnamon. Yeah. The cascade slows a bit, as does the burn. Shhhhh... I press my fingers to your lips and say, "Hold me." The transition is a calming one. Notes don't dull, they slow. Sweetness soars but the tingle of white pepper and bracing of leather are not too far below. Peanuts highlight the tobacco note. Ash whitens. Mom's sandwich. Great mouth-feel. Some cinnamon finds the white pepper and the tingle amps up warmly and nicely. A medium+ profile and -medium strength zetz. Coconut is definitely there, I was speaking of that earlier today in conversation. I had this Manolo Estate in mind, you. It's especially on a retro-hale finish after the cinnamon then white pepper. The blending is genius here, what the Connie doth doeth with the Criollo. Ah, the final act of our meditation. I'm already lamenting the curtain fall. A note: (agin) the ash is a bit precarious, so keep that in mind, and a schmatta in yer lap. Toasting roasting stops. Construction holds fast. Flavors are unchanged. Some might see this as a fault, no dazzling metamorphosis of notes, but if the note is well played -- keep playing. This particular one fits me just right. I well think of it as worth trying on for size, gentlepersons. Retro-hale sharpens a tick now, and is not necessary. The coconuts are on a simple pull and also some macadamia vibe. 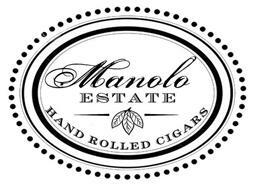 A lovely offering from Manolo Estate, this Connecticut Gran Fino. Just lovely. Now if you'll excuse the heck outta me, I'll take my leave and grab a toothpick as I does. Through the band, there is an increase in cinnamon spice and thinning of creams. Very clean outtro. Primary Note(?)? Creams. White pepper. Pale nuts. I do love Ruby Vondella, my mini Dachshund. I do not, however, love dogs. In my carport/HQ, as I type this, a cat is on my desk and another is eating from its bowl slightly off to the side on the concrete below. It's quite nice. I do think cats breed a great deal more sanity into all situations than do dogs. Don't tell ruby I said that. Do, try a Manolo Estate offering. All three are dee-lish, gentlepersons.